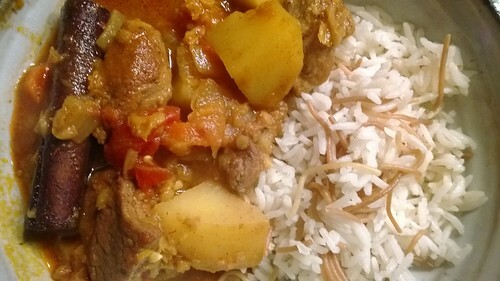 Dear J - I am looking forward to another wonderful year of friendship, fun, and fud with you and N. With a busy Saturday, I decided to use the slow cooker for a simple dish. I started with this chow recipe.I cooked the potatoes separately, parboiled and browned in the skillet. The roasted cauliflower was dressed with anchovy vinaigrette. Although not a meal I would normally prepare, it was very simple and fast. It required little active time (and clean up was a snap also). Overall, not bad. 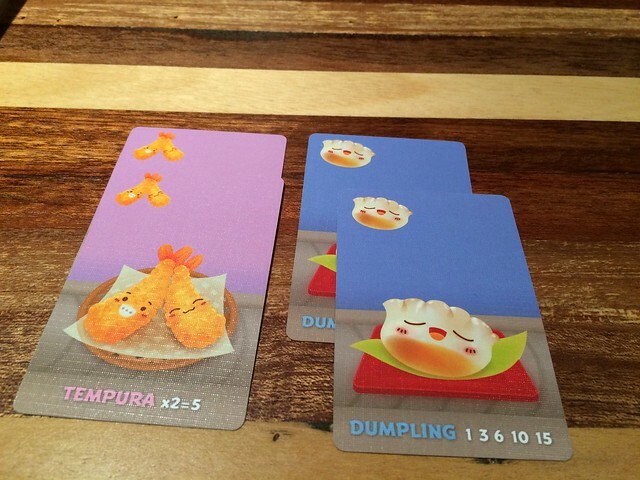 Which leads me to suggest a new game - Sushi Go BGG. You mentioned it while you are at the XOXO conference. A new game to start a new year. Two of my favorite food- tempura and dumplings above. The draw and pass is interesting, as well as keeping an eye out on what other players are working towards. Good and light game for those low brain power evenings. The art makes me chuckle. Is it just me or have things been insane the past year? Maybe we can do some catch-up over the next few months. On Saturday we managed to all be in the same place for dinner + games. 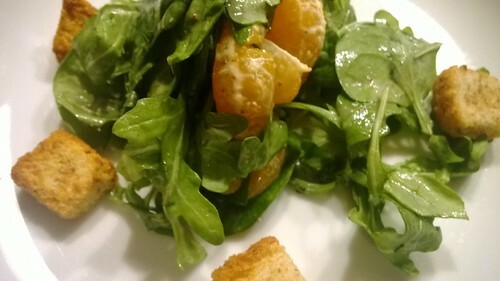 I threw together a super basic salad of arugula and spinach with clementine slices and a honey mustard vinaigrette. Basic but necessary green stuff. N made a Moroccan inspired stew with a lamb leg, red lentils, butternut squash, onions, tomatoes, and potatoes -- lots of spices. Cumin (seed and ground), cardamon, cinnamon, paprika. With a bit of basmati rice and toasted vermicelli. I guess vermicelli should be added after the rice is cooked so it stays crunchy. 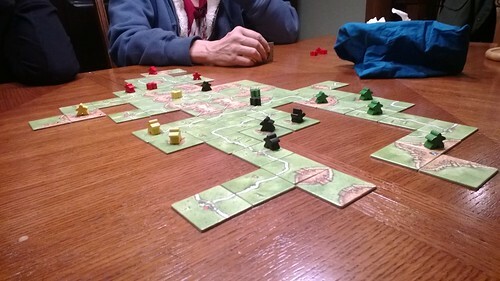 After dinner, it was a bit late and I didn't feel up to playing our new copy of Chaos in the Old World (BGG), so we played a couple of rounds of Carcassonne. I had no idea G hated Carcassonne so much. I find it much less boring than ohhhh, say, Uno. 'Til next time, and maybe better documentation on my part. Hi J - The weather has been really (read unusually) good, so I decided it is time to put some meat on the fire. 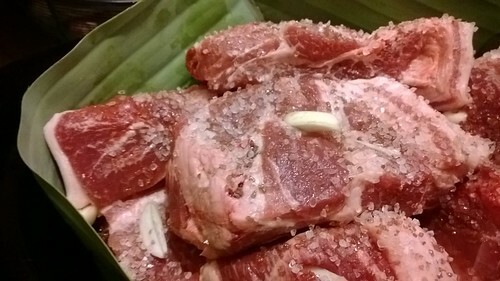 I saw this Pok Pok pork ribs recipe and wanted to give it a try. I usually brine country ribs, but did not this time. So it turned out less juicy than usual, even with the dipping sauce I drizzled on before serving. I am not too sure this recipe will make it into the rotation, it was just ... average. For vegetable, I made a salad with carrots, jicama, and lettuce, tossed with a green papaya salad dressing recipe. I added sweet mandarin oranges to balance the salty tart flavor. Oh look. 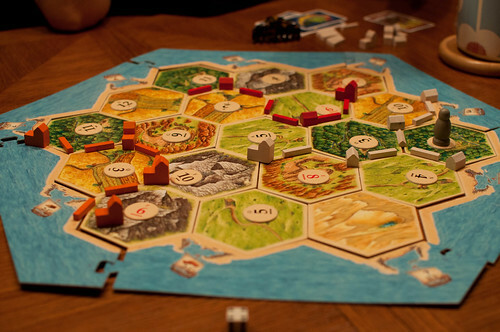 Is this Settlers of Catan? notice there is a color missing (ahem, it's red). I guess someone got frustrated at the end of the game and pulled the pieces before I had a chance to take the end of game pic. This week I had a hard time planning dinner thanks to a super-restrictive allergen-avoiding diet. But I decided to try to fake Kalua pork in the crock pot. I followed a recipe on Nom Nom Paleo. The only change I made to the recipe is that I wrapped the pork in banana leaves. It really made the house smell terrible but the pork itself was tasty. 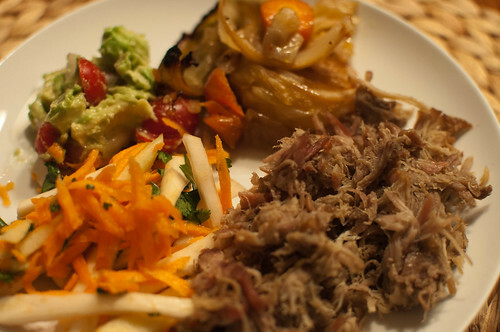 On the side we had braised cabbage (another Nom Nom Paleo recipe -- I loved it! ), guacamole, and N made a salad of jicama, apple, carrots, mint, and cilantro which was refreshing. 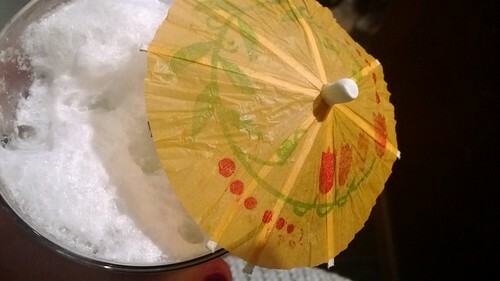 But it was an excuse to use drink umbrellas. 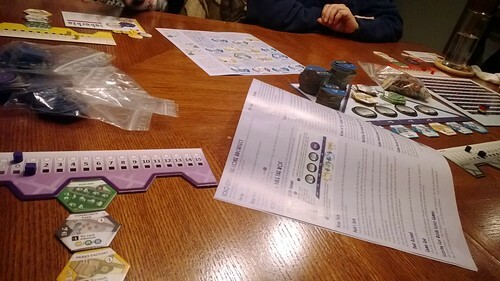 After dinner we broke out Suburbia but quickly became overwhelmed at the calculations and steps involved in placing tiles/building our cities. Then we set up Tzolk'in, which I have been looking forward to playing. I think we had a few rules not quite right, but that we did figure out the game mechanics and it started to all make sense. It was a fun test round. By the end of the game, G was looking very tired! I don't blame him. I hope it doesn't mean he hated the game and I hope we try it out again soon. This year I thought of maslenitsa before it had passed. 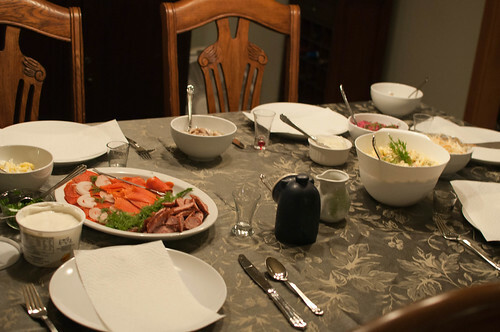 Almost every year I think of it too late, and N balks at eating bliny outside of maslenitsa, with this exception. 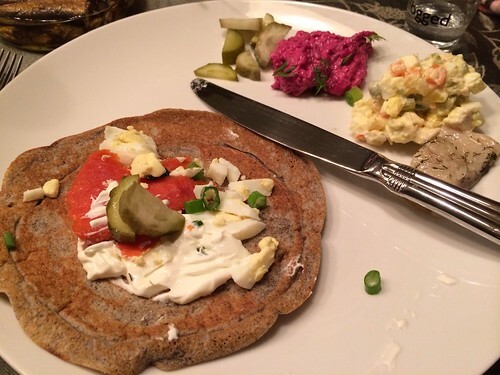 Buckwheat bliny with savory toppings is one of my very favorite foods, and I would like to eat them more often: at least once a year for maslenitsa! You brought a friend from work, A, to dinner and she brought Olivier salad, another Russian standard. I really liked it! Very finely and precisely diced. Yum. N made buckwheat and plain flour bliny. The buckwheat are my very favorite. Toppings wise, we had: herring, hard boiled egg, caviar, pickles, smoked salmon, marinated red onion, sour cream, melted ghee, and khabanosy. 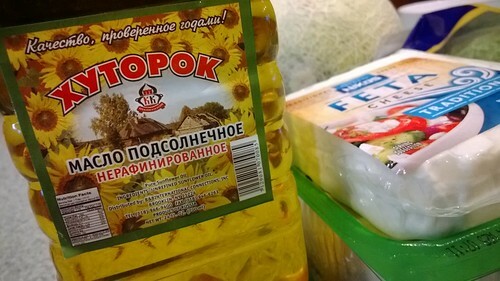 In addition to A's Olivier salad, we had vinegret and krasnaya kapusta (my transliteration there might be wrong). 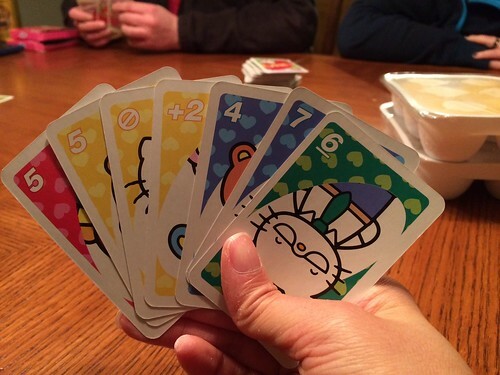 And after dinner we played some Hello Kitty Uno! I love Hello Kitty Uno. It seems to make people play more nicely. Or maybe it just makes me smile. Dear J - I was happy to have cooking as a distraction on that sad Saturday February 22nd. Even thought I knew the day will come when I have to make the decision for the Fuzzies, it was not an easy day. I forged ahead, knowing it was a sound decision and they would be happy to see you and N.
When you asked me on Thursday whose turn it is, I hadn't given it much thought. 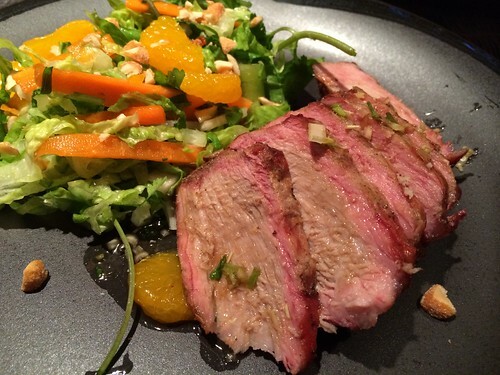 A quick glance at the current issue of Bon Appetite, I selected Pork with Squash stew with chilies and Kohlrabi salad. The recipes fit all the criteria - not chicken, one pot, warm, and not too involved. Even thought I was a little skeptical how few ingredients the stew had. I followed the direction almost exactly, substituting butternut squash for delicata. 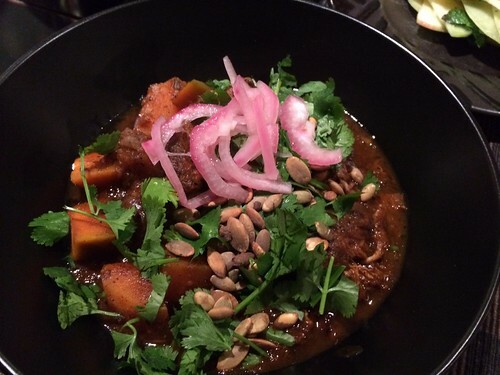 The stew was flavorful and the meat tender. I was surprised G said he liked it. It was nice, but not sure it earned a repeat in the rotation. The salad. 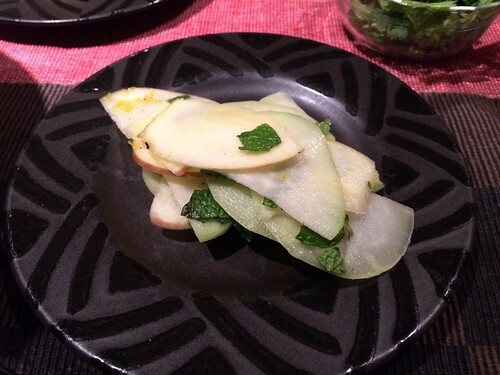 I've wanted to try kohlrabi for a while, this recipe was super simple. I used the white balsamic lavender vinegar from you. It has a great floral, not overpowering, fragrance. Oh, so Sunday morning, I discovered I left the hazelnuts in the toaster oven. I do seem to always forget an ingredient. 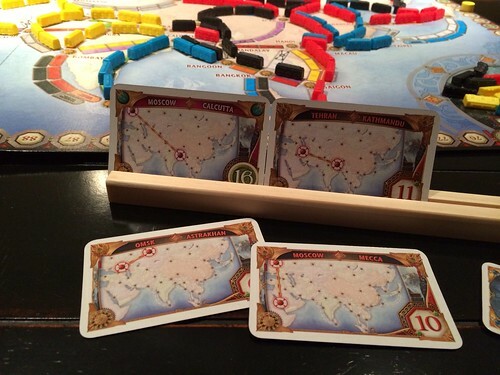 After dinner, we decided to try one of your Christmas gifts, the Asia expansion to Ticket to Ride. It is a map of Asia, routes, and card holders. 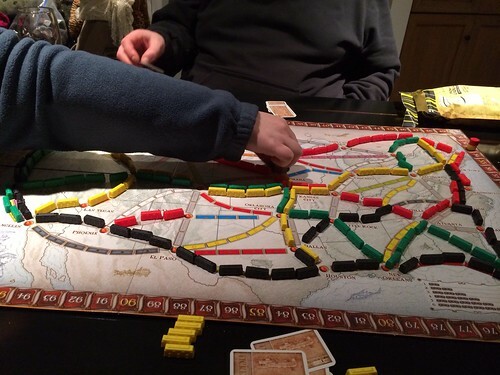 It uses the original Ticket to Ride trains and scoring pieces. I managed to finished four routes and had the western part of Asia by myself and still lost. Hmm. I am starting to think it is all in the routes. P.S. Thank you for bringing sushi for my birthday dinner. It was tasty as always. I just noticed I had approximately 57 tabs open with recipes and remembered that I have fallen down on my TNN blog duty. Jeez. Whack me with a club! 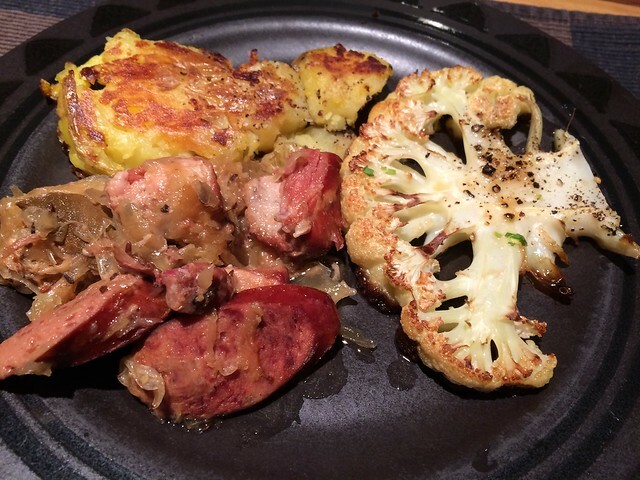 Many weeks ago (ahem first weekend in February), we did a simple dinner of meat 'n potatoes. Last minute planning. 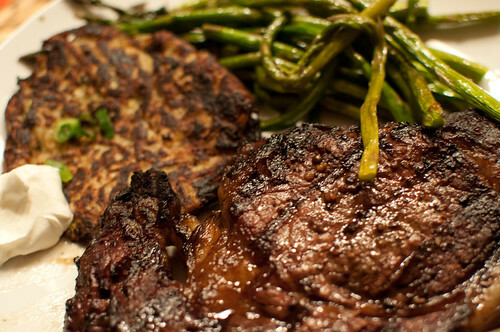 Grass-fed ribeyes from Whole Foods on the grill. Not much to say there! Latkes -- fried in a combination of butter and sunflower oil. I think they need less potato powder and more potato shreds. Aspargus, roasted in the oven a bit too long-- as usual! I cook it fine at home with us, but somehow, add company to the equation and I flail and the asparagus inevitably gets overcooked. Sigh! 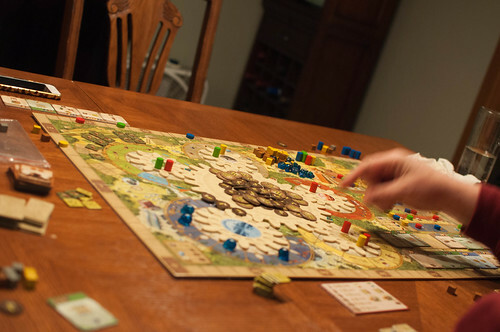 After we booted someone from your seat, we played some Settlers of Catan. 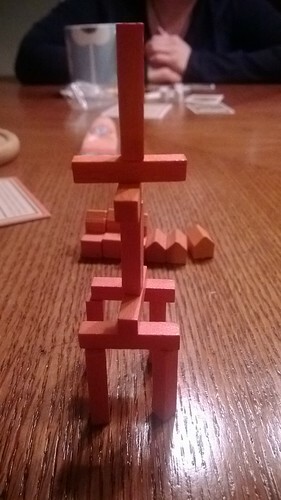 Or maybe you all played Settlers and I worked on my architect skills. 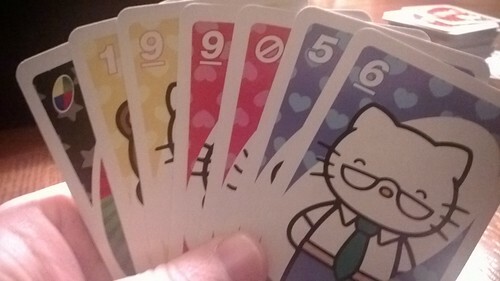 After Settlers, we pulled out my new Hello Kitty Uno decks. Well. I think they are much less annoying than the last few decks of Uno cards, but I might be biased by the cute. I don't remember who won. Does it matter? There's no strategery! Dear J - Two Fridays ago, I decided to take some mental health time. Cooking therapy of comfort food was in order. I started by rendered some prosciutto end (thanks! ), browned some oxtails, added onion and garlic, and deglazed with red wine. The pot simmered for most of the evening on low, filling the house with the rich smell of meat. It rested overnight and the fat solidified for easy removal. On Saturday, I reheated the pot and simmer on extra low until meat was tender and falling off the bones. And skimmed more fat off. Then added portobello mushrooms, carrots and canned of San Marzano tomatoes. Accompanied by polenta and some roasted collard and kale, with shaved Parmesan on top and sprinkled with parsley. Oh, almost forgot, I got some miscellaneous meats from International Deli - bear sausage, spicy pork (? 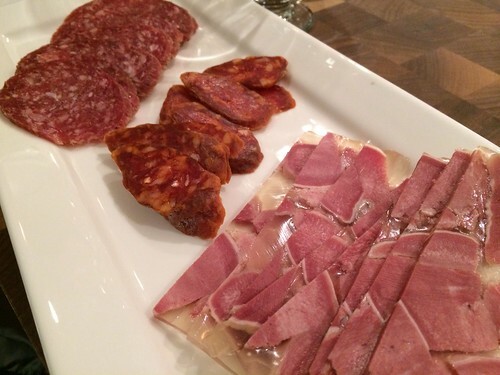 ), and tongue headcheese, and a small slice of Halva with chocolate for dessert. Much debate about whether the sausage was actually Bear. And much thanks for bringing a growler of beverage. You are right that I was really worried. Certain people (plural) dislike certain textures. So when I pulled the bones out, I also tried to pull out the gelatinous bits. Then I also remember (I think) that you mention certain people like their protein separated from the starch and vegetables. Here I am, serving ambiguous protein, with starch and vegetables in one dish. "There is always Taco Bell." By request, we played Ticket to Ride after dinner. N won. I picked three initial routes that overlap, then an additional one that extends from my original three. I thought I played a very thrifty and efficient game, but still lost. Hmm, N has a winning strategy.I think we may have played out this game. 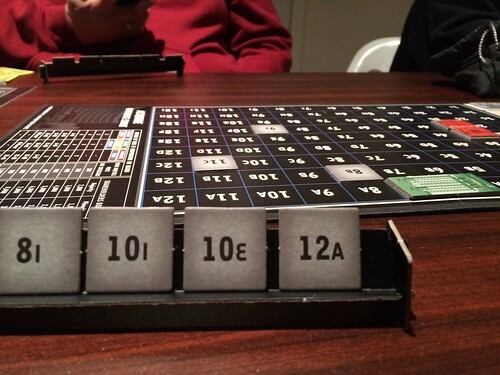 Power Grid may be in order (BGG). For the holidays this year, my mom and I bought one another the same cookbook, Jerusalem. This cookbook has quite the cult following -- people have been having Jerusalem parties where each person invited brings a different dish from the book and it was the top-selling cookbook in the summer of 2013. It's not a cult party, but I decided shortly after Christmas that I would make the roasted cauliflower salad and kofta for our next game night. That's just what I did. 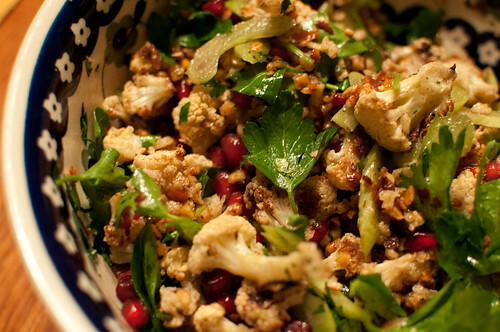 I really liked this roasted cauliflower and hazelnut salad. I roasted the cauliflower and toasted the hazelnuts in the morning, then put the rest of the salad together later. The salad has a head of cauliflower, roasted. I tossed it with the spices -- cinnamon, allspice, salt and pepper. 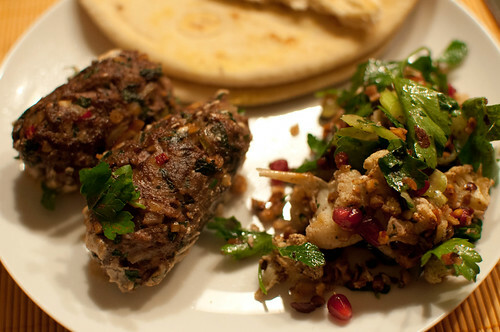 It is tossed with celery, toasted hazelnuts, a ton of flat parsley, and pomegranate arils. I let this sit for a few hours at room temperature before adding a touch of the dressing -- sherry vinegar, maple syrup, and olive oil. I really liked this salad a lot and think is a great winter salad. You'll have to let us know how it held up overnight, since you took the leftovers! Along with the salad, I made kofta. 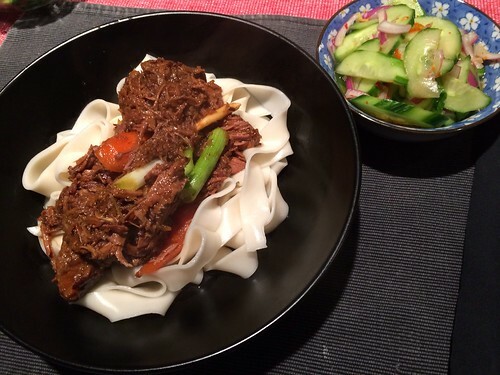 I used half local grass-fed lamb (it was VERY lean) and half local grass-fed beef. I wanted to cook the kofta medium-rare, so I was a little particular about the ground meat I picked up. I probably would have cooked them a little more if G wasn't under the weather at home! The recipe in Jerusalem is a little different from other kofta recipes we've made. There's no binder but it does include onion, garlic, pine nuts, parsley, a medium-hot chile, and more spices. I made the meat mixture and formed the kofta in the early afternoon, then set it in the fridge to chill and firm up. I believe this helped them hold their shape without a binder. Then I seared them in sunflower oil, per the recipe. This took a little longer than I expected. I pulled them out of the pan at 120-125°F, then placed them on a platter with tahini sauce, and popped them into the oven, just for a few minutes, taking them to medium-rare without losing their crust. I'd give both recipes a thumbs up. I've made about five or six recipes from Jerusalem now, and there hasn't been a bad one yet. Not bad! 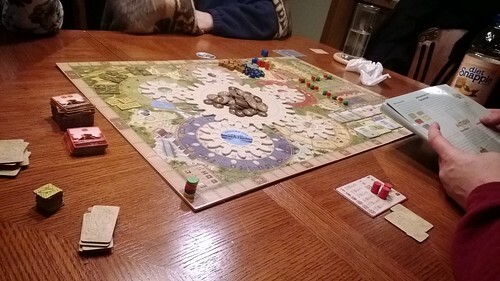 Before dinner, I had wanted us to try Tzolk'in for the first time. 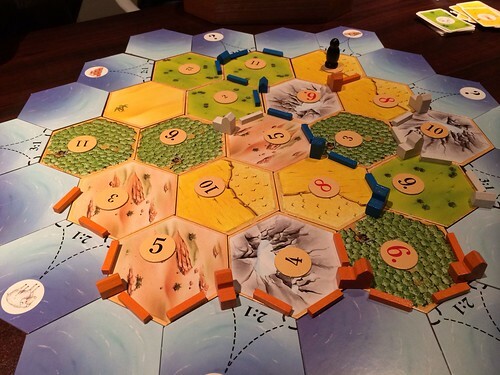 But I didn't have enough time to learn the game in advance, so we fell back to the old standby, Settlers of Catan. With just three players, there was so much space on the board. It was like stretching out in a huge hotel bed. I tried to fly under the radar as I picked up grain and ore resources and upgraded my settlements. I managed to pull off the win! Yay me! Next time up here I hope we can try Tzolk'in (BGG). It looks promising! This video of the gameplay might be worth watching in advance.